It has been said that art imitates life. Sometimes, however, it’s the other way around and life imitates art. Such is the case with the 2016-2017 version of the Dallas Cowboys. In the 1999, movie “Any Given Sunday” an aging white, veteran QB is hurt and replaced by a young, African American QB. The film featured Dennis Quaid as Jack “Cap” Rooney, the aging quarterback who was still looking for that one last shot at glory. 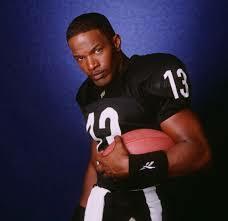 Opposite Quaid was Jamie Foxx who starred as ‘Steamin’ Willie Beamen, a young up and coming quarterback looking to make his mark in the league. If the story sounds familiar, you’re right. 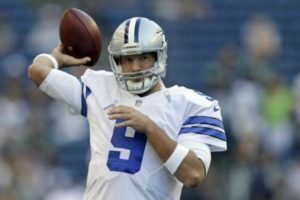 Tony Romo (Cap) was hurt in the pre-season and hasn’t taken a snap so far this year. 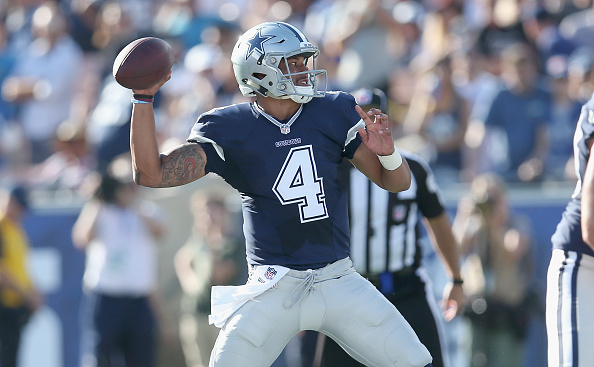 Romo was replaced by rookie Dak Prescott (Willie Beamen). Beamen – oops – Prescott, has led the Cowboys to a 3-1 record and has looked good in his four starts. Another similarity between the movie and the Cowboys was Beamen had run afoul of several teams prior to taking over for Cap while Dak had an off-the-field issue shortly before the draft this year, which caused his stock to drop. As any critic of the film genre will tell you, drama often times comes from controversy. Once Cap Rooney was healthy, Willie Beamen took a back seat and was relegated to the bench. Dak hasn’t faced this yet, but Tony Romo is slated to be available in Week 8, after the Cowboys’ bye. If you’ve watched the first four games of the Cowboys’ season, when the cameras cut to a shot of the injured Romo, you could almost see that same look. After all, this is a QB who has played with a broken back. 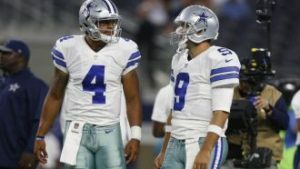 If you listen closely, you just might hear Tony Romo tell Dak Prescott the same thing. “Any Given Sunday” was released at the end of the ‘90s and the Cowboys were less than five years removed from their last Super Bowl win. In the film, as Willie Beamen was talking to Coach Tony D’Amato (played by Al Pacino), he glanced at photos from the team’s salad days. You almost have to wonder, 17 years after the movie was released, when Dak Prescott looks at pictures or trophies at the Cowboys’ brand new training facility, is he thinking the same thing?